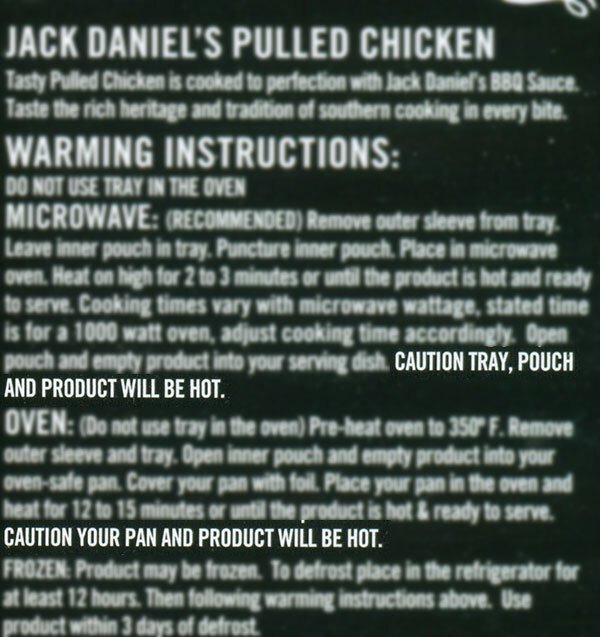 If you cook something, it will probably be hot, as will the vessel in which you cooked it. One of the things Dorena and I like the most about TGI Friday’s is the selection of food prepared with Jack Daniel’s BBQ sauce. When we came across this heat and serve product, we figured we’d pick it up and give it a go on a lazy night. Expectations were pretty low, as we knew it was obviously not going to turn out as well as if we slow cooked it ourselves, but it hit the spot enough that we’d pick it up again for another lazy evening. This one chick on Walmart’s site doesn’t agree, though. I normally get tony romas pulled pork because it’s a dollar cheaper but this time wanted to try chicken and I only saw Jack Daniels pulled chicken so decided to get that. Big mistake, the bbq sauce is not as tasty and the meat is not as flavorful as Tony romas. I’ll stick with tony romas pulled pork, hopefully they have the chicken one so I can try that as well since I prefer chicken over pork as in health reasons but prefer pork over chicken as in taste. The reason I made this post was for the package. In the heating instructions, they provide truly insightful advice. Oh, really? Good lookin’ out, JD. Good lookin’ out. Next Next post: Restocking my desk’s shelf with toys!